Opening the back cover casing of Galaxy S III procedure is almost like the way you must do on taking off the cover of Galaxy Note II: including the must thing to do to be able to insert sim card and memory card. One important tips: having a strong fingernails seems to be a kind of advantage for opening the cover of this smartphone. Removing the back cover can be start by inserting your fingernail (fore finger or middle finger) to the opening hole available on the top side of the phone (the SGS3 is facing down). Then pull it out until the cover is open. You can continue by pulling out gently the side of the cover by using your finger nail. Replace / Close the Back cover: There simple steps you can do to make the cover back to the phone: align the cover with the phone, then press it firmly into it place. You might hear some "clack" that indicates the cover is firmly attached. Meanwhile, on the right of the SIM card slot (pictured), you'll see a memory card slot. To insert the memory, just make sure the gold contacts is face down then press and move it slowly to the card slot until it's firmly fit in. If your external micro SD is a brand new storage and need to be formatted all you need to do just go to: Settings > Storage > Format SD card > Format SD card > Erase everything. It's up to 64GB microSD can be handled. To assemble the 2100 mAh battery capacity on this SGS3, all you need to do just make sure the battery connector is align with the phone's connector (number 1) then just push the battery to the compartment. If you need to remove the battery there is a kind of cave that you can use your finger to pull the battery out from the compartment. Charge the battery: Just user the USB cable connector which available along with the package the connect it the USB to the AC adapter, then the Adapter to the Power supply, and the last the microUS v2.0 to the USB connector on the SGS3. Instead of using the adapter, you can also connect the USB cable to PC or Computer while you wanna make file transfer or updating the firmware using Samsung Kies. It also would charge the battery, though it takes longer than using the adapter. 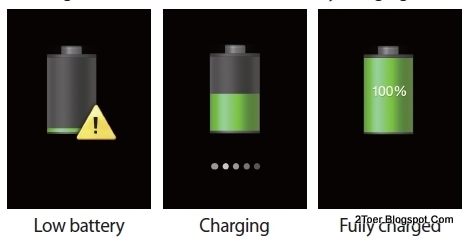 The image above is the picture tutorial that indicates about the charging process. You need to immediately charge the phone if the battery is low and need to unplug the charge if the battery is full (100%). Factory Reset: On the Settings of the GT I9300 menu you can find the Backup and reset option. Then to do Master /Hard / Factory Reset, tap Factory data reset > Reset device > Erase everything. You might need this action if you find a "non-fixable" problem, such as your SGS3 freezes or has fatal error. You might need this Resetting process if you wanna sell your SGS3 to clear any setting and data and getting back the phone as it like a brand new that just came from the phone shop. Once Again: Almost all the tutorial for Opening the Cover, Insert the microSD, Charge the phone, Assemble Battery, Insert SIM Provider Carrier of this Samsung Galaxy S3 SGH-I9300 also can be used on the other version of SGS3 such as for AT&T with SGH-I747, Sprint SPH L710, T-Mobile Carrier SGH-T999, US Cellular Provider SCH R530 and also Verizon Wireless for SGH I535.